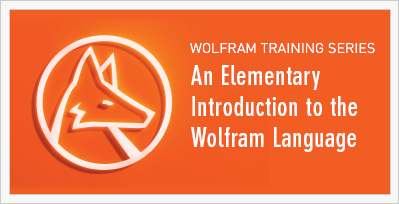 Join Wolfram Training for this free online training series based on Stephen Wolfram's book An Elementary Introduction to the Wolfram Language. Each session covers different chapters from the book in depth and explores additional examples and exercises. Learn how to perform calculations, manipulate images, analyze real-world data and even deploy your own cloud apps with the powerful and elegant Wolfram Language. And don't miss out on the opportunity for interactive Q&A with the host, Wolfram Language veteran Dave Withoff. Missed a session? Watch previous session videos here. Session 1 Learn the basic tools for getting started and see how simple it is to do elementary arithmetic, use functions and create and manipulate lists in the Wolfram Language. Session 2	Dig into the Wolfram Language's built-in graphical capabilities, from displaying text, shapes and images to interactive interfaces using Manipulate. Session 3 Explore the wide scope of the Wolfram Language, which includes more graphics, sound and using real-world data. Session 4 Learn how to interact with units of data, dates and times and the Wolfram Language's extensive built-in knowledge of geography. We also explore how to interact with data as graphs and networks and expand functions using options. Session 5 Explore the array of tools built into the Wolfram Language, such as machine learning, robust number handling, visualizations and different notations for applying functions and creating pure functions. Session 6 Discover how to test conditionals, utilize pure functions and rearrange lists with ease in the Wolfram Language. Session 7 Continue to explore the Wolfram Language's unique symbolic structure and expressions, including taking parts of lists, searching for patterns, creating Associations and processing natural language. Session 8 Learn how to develop and deploy your own websites and apps and customize the layout and displays of your visual elements. We will also discuss assigning variables and using the power of delayed assignment. Session 9 Expand your Wolfram programs by learning how to define your own functions, using the sublanguage of patterns, working with String patterns and templates and storing your data locally or in the cloud. Session 10 In this last session, we show how to import and export hundreds of formats to work with a variety of datasets, write good code and debug your code with the Wolfram Language.